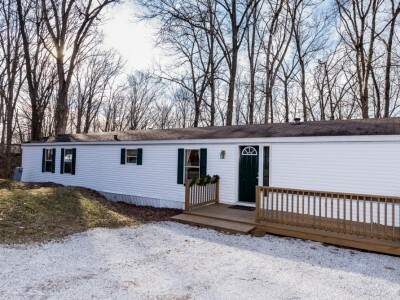 Located on the landmarked property of Scenic View, just 1 mile from Lake Monroe & 10 miles from downtown Bloomington and The Indiana Hoosiers college campus, this modernized modular home is not one to overlook! Nestled behind the Scenic View Campground*, this quaint hideaway abuts state forest and boasts canopy views atop one of Indiana’s best panoramic hardwood ridges. The home has a master bedroom (queen) and a large master bath with garden tub and separate shower and second bedroom (double) and separate bath with shower and tub combo with a kitchen open to a dining table, two seat bar nook, living room area with plenty of seating, large flat screen TV with Dish Network, large outdoor deck, grilling area, and a 5 person hot tub as well as a private fire pit for stargazing or telling tall tales into the night. The secluded back deck overlooks the wooded Hoosier National and has nearby access to hiking trails leading into the Deam Wilderness. Perfect for nature enthusiasts, snow birds, visits to IU campus games or events, family gatherings, private romantic getaways, boaters, hikers & hunters and all things lake life. Enjoy! Scenic View Campgrounds is a 45 site RV camper village nestled in the wooded area of the Scenic View property. Our campers rent the spaces for the entire season and in most cases, inhabit their living spaces on the weekends. They come to vacation with friends and family and often have cookouts & campfires. Most of our Scenic View Campground patrons have extended families joining them, most with boats and trailers due to the proximity of the Lake Monroe. You may expect to hear guests up late at their campfires or on their porches. This is going to be more pertinent on holiday weekends as opposed to during the week. This is a great location for many reasons and a nice little rental getaway but it is not a secluded vacation rental and you will have guests around you. You can enjoy the back of the home and the privacy overlooking the nice woods behind!